DiamondsHere offers our FINE QUALITY and our popular TOP OF THE LINE QUALITY! Mounted in our solid four prong lever back mountings. 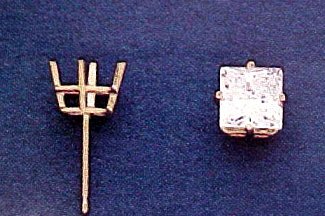 Choose 14K Yellow or White Gold. 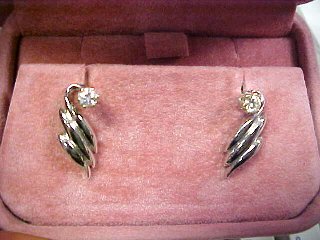 All earrings from DiamondsHere are delivered in a plush box. Call 1-800-279-4337 today! DiamondsHere offers our FINE QUALITY and our popular TOP OF THE LINE QUALITY! 0.48CT TW PREMIUM round brilliant cut diamonds of I Color, VS2 Clarity. Mounted in our solid 14k four prong lever back mountings. 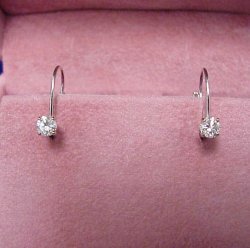 All earrings from DiamondsHere are delivered in a plush box. Call 1-800-279-4337 today! 0.60CT TW round brilliant diamond drop earrings of H Color, SI3 Clarity diamonds mounted in white gold. We select our diamonds to make a perfect matched pair and sell our diamond stud earrings by EXACT DIAMOND CARAT WEIGHT! 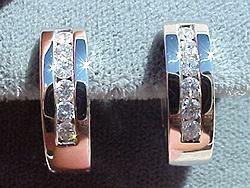 DiamondsHere offers our FINE QUALITY and our popular TOP OF THE LINE QUALITY! Mounted in our solid four prong lever back mountings. Choose 14K Yellow or White Gold, All earrings from DiamondsHere are delivered in a plush box. Call 1-800-279-4337 today! 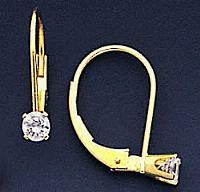 0.48CT TW of G Color, SI2 Clarity channel set diamond earrings set in 18K gold. We select our diamonds to make a perfect matched pair and sell our diamond stud earrings by EXACT DIAMOND CARAT WEIGHT! 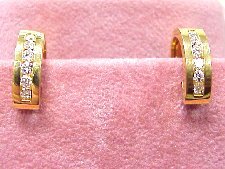 SAVE $$$ with these gorgeous 0.50CT TW fine make diamonds of G Color, SI1 Clarity...each perfectly channel set in 14KW gold HUGGIE style mountings...very nice! 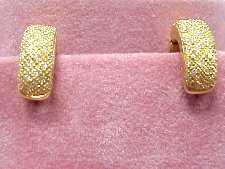 18K gold Huggie style Pave' diamond earrings (0.34CT TW). We select our diamonds to make a perfect matched pair and sell our diamond stud earrings by EXACT DIAMOND CARAT WEIGHT! 0.40CT TW round brillant diamonds of G Color, VS2 Clarity set in solid platinum! We select our diamonds to make a perfect matched pair and sell our diamond stud earrings by EXACT DIAMOND CARAT WEIGHT!